Mutual fund with 12% return?! He then goes on to explain how the S&P 500 has averaged 11.67% in the last 80 years and how this indicates that you should therefore be able to get the same returns. 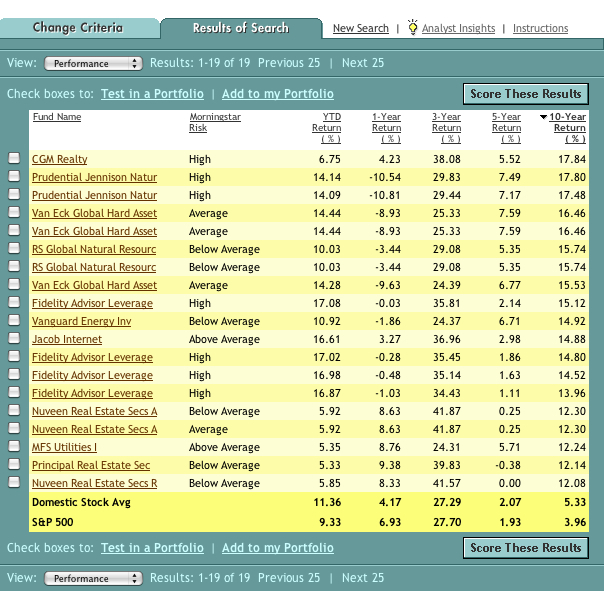 Now, you can search for funds that have averaged 10 year returns over 12% on Morningstar (I found 19). But none of the above funds had the tenure that Ramsey had indicated in the book where he’s citing data from the 1930’s. Ramsey did give return data but slyly did not tell you what funds he’s invested in, rather referring to you to speak to one of the “approved” advisors (I would assume that they pay a fee to be approved by Mr Ramsey who must share his secrets with them). So a little more digging led me to this list which does seem to be the funds that Mr. Ramsey is talking about in his book. Hey if there are magical funds out there that are giving you S&P returns over the long term then sign me up (keep in mind this means they have to be beating the returns of the S&P since there are fees involved). But why aren’t any of the funds that’s recommended by him on my morning star list? So I dig a little deeper. I looked at American Funds Invmt Co of America fund. The fund was created on March 31, 1934 just as the country was coming out of The Depression. Up to Dec 31, 2011 it had an average return of approximately 11.79% annually. Even accounting for inflation which was 3.37% over that time, the returns are still above 8% annually. So Mr. Ramsey seems to be telling the truth. But again I ask, why isn’t on my morning star list? It didn’t make it on to my little search list because it’s return for the last 10 years is only 4.42% although it has been out performing S&P by 0.42%. And that’s the problem that Mr. Ramsey’s critics and myself included have with his assumption of 12% return. Just because a fund has returned on average 12%, doesn’t mean that your return will be 12%. When you invest matters a lot. If you were smart and got into these funds 3 years ago at the depth of the current downturn, your return on this fund would be over 20% annually. However if you started to invest 5 years ago (at the top of the market) your return would only be 1% annually. Mr. Ramsey will of course say that for you to gain the average return, you need to invest in the long term. As you can see, the 10 year results aren’t 12% but what if we look at 20 years? The answer is 5.99%. Only when you go back 30 years – a very long investment horizon for most people – do your numbers start to look better at 11.88%. The question is will you able to hold the investment for 30 years and ride through all of the 50+% corrections? What if that correction came as you are just about to retire? These are the questions that many who are nearing retirement are grappling with. Work out what kind of returns you need to retire – be reasonable in your assumptions about your life style and government program’s availability. Likely the return won’t need to be 12%. Create a portfolio that can give you a good shot at that return. If you only need 5% to retire, then a more conservative portfolio will work. If you need 6-7% a 60/40 portfolio will work. Make your portfolio more conservative over time so that corrections have less impact on you as you near your goals, but keep your return assumptions the same. Track where your investment funds should be annually/every 5 years and see if your portfolio (including money you may still be adding to to it) is meeting your objective. If it isn’t, then you need to put away a bit more to guarantee the returns. This way by the time you retire, hopefully you will guarantee you have the amount of funds you will need through both investment returns and putting enough away.